They say the two best things a mother and father can give their kids are roots and wings. To this I add Old World grandparents. Mentors, who teach, encourage and inspire us as we grow. People whose influence touches our lives like no other and whose ways and wisdom’s stay with us a lifetime. Like most people, I love to eat good food, especially during the holidays when an abundance of traditional fare is set upon the table. And, like most people, who have strong family ties, I enjoy the taste and textures and aromas of the foods of my heritage. To me these foods represent a continuity of family and family traditions. For that reason, I like to prepare these recipes that were passed on to me by my grandmother, who so carefully preserved each of them in her memory. No recipe books for her, when she gave me a recipe it was merely a pinch of this, a handful of that, etc. But somehow her recipes have always come out to perfection. Grandma had a great instinct for cooking without recipes. 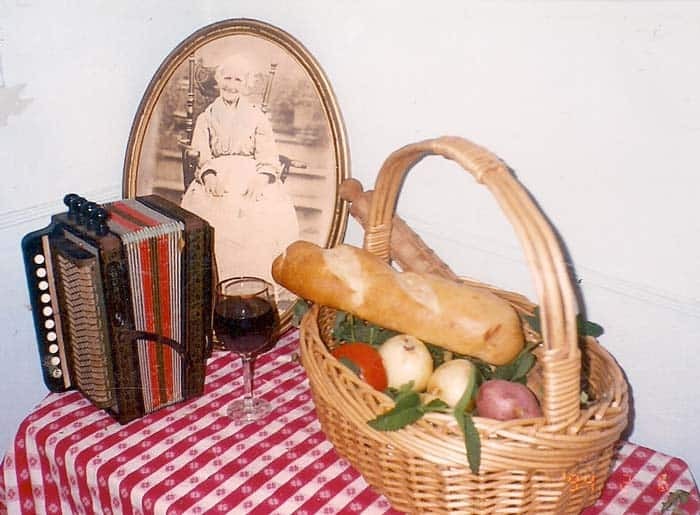 Food and its nourishing qualities were a very important part of her survival in the old country. Not only did her ancestors prepare food for its taste and texture but also for its health benefits. I guess that’s why each of grandma’s receipts are made up of certain vegetables that, today, modern medicine has proven to be good for us, for our hearts, our minds and our overall wellbeing. My ancestors were all excellent cooks, they believed, as do many from the Old Country, that a meal of these favorite foods relieves the tension of a stressful day and that our spirit sighs after a good meal. I guess that’s why grandma believed we should spend that time in rest and reflection. Garlic was grandma’s favorite herb. Her eggplant relish is a veritable smorgasbord of beneficial ingredients which, of course, includes garlic. Most everyone knows about garlic’s pungent flavor, and is well aware of this bulbous perennial’s reputation. But to grandma, the garlic was irreplaceable. A relative of the Lily, the huge ball like blooms of the garlic plant are fused with hundreds of tiny lavender blooms that, like their bulbous root, are rich in sugar and almost as pungent in fragrance. Ancient Romans believed strongly in the power and value of garlic and grandma was no different. She believed it made her skin more beautiful and smooth, she used it to treat toothaches, sore throats and earaches. Modern medicine backs up grandma’s belief in the herb. Researchers are finding that garlic contains allyl, an antibacterial agent that seems to affect harmful bacteria. Today, many people are taking garlic capsules to treat the cold virus, diarrhea and poor blood clotting and also to lower blood pressure. Combine all ingredients; mix well. Bring to a slow boil. Reduce heat; cover and simmer for 20 minutes or until vegetables are tender. Cook a few minutes longer, uncovered, until slightly thickened. Makes a delicious garnish or side dish. The eggplant is a member of the potato family and like the potato It’s a great source of fiber in our diet and it contains low amounts of vitamins A, B and C .Low in calories, about 25 per serving the eggplant is also low in saturated fat, cholesterol and sodium .it also has amounts of thiamine and vitamin B6. For best results eggplant should be started from young seedlings. select Plants in individual containers 4 to 6 to a pack. It’s important to get the plants off to a good start. Always plant after the soil has warmed and there is no longer a danger of frost. Eggplants are more susceptible than tomato plants to injury from low temperatures and won’t begin to grow until soil has warmed. Plant in raised rows 12 to 24 inches apart, depending on the size of your eggplant at maturity. Eggplants thrive in the heat of summer and tolerate dry weather but need good irrigation during dry periods.. Harvest the fruits when they are 6 to 8 inches long and still glossy. In my family, the cold virus was treated with a bowl of hot chicken soup. Can a little hot water, onions, celery and chicken broth truly be a medical treatment for the common cold. We know parsley contains chlorophyll, a traditional remedy to cure bad breath and to settle uneasy stomachs; carrots and celery are rich in vitamin A, so important for good eyesight and healthy skin and poultry meat is a good source of the B vitamins, including riboflavin, niacin and biotin so necessary to use oxygen and protein in the body. For Grandma, cooking was a way to express her emotions; it represented her joy at living in a new land and the continuity of her family’s traditional recipes. It was these same recipes and beliefs that grandma passed along to her daughters and her granddaughters. If grandma loved garlic, then it could be said that she worshipped the tomato. Her homemade tomato sauce bubbled on the stove like an eternal volcano. The familiar and mouth-watering aroma of her sauce permeated the kitchen and welcomed us to her home. There are many things that link me to my past, but few rekindle memories as quickly as the smell of tomato sauce simmering on the stove. Tomato seeds can be started indoors in individual pots in mid. March to April. But, like grandma, I prefer to start with seedlings in May. Tomatoes require a loosely packed, well-drained soil generous in organic matter. A good mix consists of one part each of potting soil, perlite, peat moss and compost. Pure Garden soil isn’t a good idea as it most likely is filled with soil pests. Every compost mixture must contain these basic ingredients: nitrogen, carbon, water and air in order to transform yard waste and kitchen scraps into nutrient-filled compost. Grandma combined an equal amount of nitrogen rich plants such as grass clippings and kitchen scraps (any fruit and vegetable peelings, coffee ground, leftover pasta) with carbon rich plants such as fallen leaves, twigs, and garden clippings. Once she had the green (nitrogen) and brown (carbon) components assembled, she layered them intermittently or chopped the ingredients, which hastened decomposition. Grandma kept her compost heap behind the garage and made sure to water it every day, keeping it most but not wet, and always well aerated. Compost heaps can heat up to 140 F and 160 F. at that heat. Disease organisms and the seeds from added weeds are destroyed. Grandma used a garden hoe or rake to rotate the contents of the compost every other day; to make sure the leaves from the outside of the pile were moved toward the center. When using compost, make sure temperatures during the composting process are high enough to kill pest organisms. When planting, fill the container with soil mix stopping two inches from the top. Use stocky, vigorous plants and position them very near to the stake,no more than two to a 12″ container. tomato vines like room to spread and grow. Water thoroughly. Now place the container in a site with full sun with some protection from the wind. Don’t forget to check your plants watering needs every day. By mid-July you can begin to use a fertilizer solution for supplemental feeding. Miracle Grow 15-30-15 at the recommended rate. Remember never to fertilize when the plants are dry – always water them first. To keep the slugs and other pests away grandma sprinkled the area around her tomatoes with cayenne pepper flakes. Cayenne pepper was one of grandma’s favorite dried herbs and she grew plenty of the fiery hot pepper in her garden. Cayenne pepper, another of Grandma’s favorite garden plants had a multitude of uses in her kitchen.. Among the pepper’s many health benefits, the capacity to aid digestion and improve circulation; it acts as a catalyst for other herbs as well. It is believed to be good for the heart, kidneys, lungs, pancreas, spleen and stomach. And, according to grandma, it also helps to ward off colds, sinus infection, and sore throats. Many of today’s pain relieving ointments have as their main ingredient cayenne pepper. Webster’s dictionary defines garlic simply as “a plant related to the onion; strong in flavor and aroma. “But to Grandma and her family the flavor and benefits of the garlic bulb was much, much more. Grandma believed that the aromatic garlic clove was meant to be appreciated and enjoyed by all those who loved things with a passion. Most backyard gardeners are well aware of this bulbous perennial’s reputation and its many attributes. They also know this fragrant plant has one of our garden’s prettiest blooms. A relative of the lily, its huge ball-like blossoms are fused with hundreds of tiny lavender blooms that – like their bulbs – are rich in sugar and almost as pungent in fragrance. With little attention, this aromatic bulb returns years after year. I remember an old recipe grandma concocted for us kids every time we had a bad cough or cold. First , an onion was sliced into a pot of water a large spoonful of sugar and honey measured into the pot, and – here’s the important part – a handful of garlic thrown in. It was boiled on the stove until it formed a syrup. It took some doing to convince me to swallow this stuff, especially during the flu season when Grandma insisted on giving us kids a big spoonful of this mixture before we left for school in the morning. We didn’t catch cold that year – possibly because our breath was so strong no one dared get close enough to pass on a germ – but nonetheless, we all stayed hardy and healthy. ( Hint: parsley is a good remedy for garlic breath. Also, rubbing your fingertips over stainless steel or rubbing fresh coffee between your fingertips will help remove garlic’s lingering odor. The founders of modern medicine, Hippocrates and Galen, spoke highly of garlic’s attributes, it’s only recently that modern medicine is rediscovering the curative powers of this plant. Researchers are finding that garlic contains allyl, an antibacterial agent that seems to affect harmful bacteria. Because of its curative powers, many people use garlic to treat the cold virus, diarrhea and poor blood clotting and to lower blood pressure. Cookie with my backyard herbs from nonna’s garden, picture of nonna looking over her shoulder. Down through the ages, people have used garlic to treat toothaches, sore throats and earaches and even to ward off snakes, witches and vampires. In fact , nothing could be further from the truth. Garlic, like most annuals, some perennials and even small trees and shrubs will thrive in containers. They are a very hardy plant and, like many herbs and vegetables, they will happily grow in pots. The best container for garlic, generally speaking, is made of wood, clay or stone. but the simple fact is any container with drainage holes will most likely do as well., so don’t be afraid to try something different, something that pleases your gardening imagination. The first thing to do is set your pots in a well-lighted, sun filled area. Garlic, like tomatoes, love the sun. Unless your own garden soil is of the best quality, I’d suggest using a package mix of potting soil. This soil has been sterilized to prevent weed seeds from germination and the peat most helps to prevent the clomping of the soil. Compact soil can suffocate a young plant. If you decide to use a container then you must remember to water your pots more frequently and, because of the many waterings, you must also fortify your pots with additional fertilizer. Organic fertilizers are good, but they all come with specific instructions on the package you should check out. Now all you need are some great garlic recipes: the benefits of garlic are many and the joys of growing your own will be a constant and healthful summer gift from your garden. The garlic plants need room to grow, they have a huge flower and a long neck, the plant is anywhere from 3 to 5 feet tall at maturity and the flower ball 6 to twelve Incas around. I would suggest planting them one or two to a large container, 12 ,” or more around..The plant is a lovely leafy plant and it’s bloom a sweet attraction to honey bees.three or four plants may be grown in a larger, two foot round container the blooms are spectacular! Later, when the cold weather rolls around and the holiday season appears, mint becomes part of the warm and comforting holiday meals. Mint will change its look and adapt itself to the coming season when it will be used dried or frozen to flavor and garnish pork roasts, vegetables, jelly sauces, jellos and creamy desserts. MInt has its last harvest in the fall, this is the time to pick the leaves for drying or freezing for the winter. Whichever way one eats it , drinks it , or prepares it, Mint is an herb with many beneficial uses for good health. In fact, the reason most of our ancestors grew this pungent herb was for its many health benefits .Evan today, naturalist still employ peppermint to treat gallstones, irritable bowel syndrome and the common cold. The Greeks believed mints could clear the voice and cure hiccups. In fact, mint is part of Greek mythology and according to legend – “Menthe” originally a nymph, and Pluto’s lover angered Pluto’s wife, Persephone, who in a fit of rage turned Minthe into a lowly plant, to be trod upon. Pluto, unable to undo the spell, was able to soften it by giving Minthe a sweet scent, which would perfume the air when her leaves were stepped on – thus aromatic herb Mint. I guess that why I just naturally plant mint along my walkways, where my clothes can brush softly up against it as I pass by or I can step upon its perfumed leaves and release refreshing mint fragrances into the air. On warm summer nights these beguiling aromas are especially invigorating.My ancestors, like most who came here from across the sea, brought this pungent herb to America primarily for medicinal uses. Mint is a perennial and its seeds can be sowed in flats or in the ground. Once the tenacious herbs take hold in your garden, it is very easy to propagate them by cuttings and transplanting once the root system is well established. Mint needs humid soil and only moderate sunshine. It will grow in, out and around all garden plants, not unlike a weed, this herb is tenacious and dedicated to spreading through the garden The trick is to continuously cut them back and restrict their growth. Otherwise this herb will spread like wild-fire through your garden in the form of strong-willed runners. Roses make good companion plants. Mint can be grown in pots and planted with other herbs. And according to legend this is a good herb for keeping ants away from doors and combating mice and fleas. Keep mint leaves near food, beds and wardrobes. Use it to freshen the house like an air freshener it brings the fresh smell of herbal fragrance into every room. It can be simmered in a pot of water with Rosemarie, and lemon grass to create a unique and lively potpourri. Mint is commonly used with peas. Carrots, potatoes, eggplant, beans, and corn to pep up the flavor. Place the mint leaves, sugar and water in an 8 ounce silver julep cup or highball glass. With the back of a spoon, lightly crush the mint, and then stir until the sugar dissolves. Pour in the bourbon and pack the glass tightly, with crushed ice. With a long-handled spoon, gently giggle the mixture to mix the ice and bourbon together until the outside of the container becomes frosted. For the finishing touch, garish with a sprig of fresh mint before serving. SAGE GARGLE: to soothe a sore throat grandma steeped three or four dried sage leaves in a cup of hot water for about ten minutes. While the tea is still warm, use as a gargle to treat canker sores add 1/2 teaspoon of lemon to the tea. 1/2 teaspoon of salt in a glass of warm water also makes an excellent throat gargle. BASIL TEA: Grandma brewed a soothing beneficial tea from her basil leaves. Like Hippocraties, she belied sage and chamomile were among the universal remedies. To relax a nervous stomach , Grandma added a teaspoon of dried basil leaves to a cup of boiling water and stepped for ten minutes to extract all the flavor. It worked like magic on my childhood bellyaches. GRANDMA’S WART REMEDY: Wart is probably the ugliest word in the English language and even uglier when you’re a teenager with several on hour hand. Whenever I was plagued by a wart, I just naturally ran to Grandma and her garden for the cure: When the moon was full, Grandma picked her fattest dandelion weed from her herbal garden and put the milk from the cut end of the weed on to my wars. She did this three times a night. The next day, as if by magic, the warts began to mysteriously disappear. GRANDMA’S COUGH REMEDY: To treat a persistent night-time cough, Grandma set two cups of water on to boil to which she added two lemons, sliced, a half teaspoon of dried ginger or mint, and two tablespoons each of honey and sugar. Bring mixture to a boil, When the ingredients have melded into a thick syrup add an ounce of your favorite brandy or liqueur. A couple of spoonfuls of this warm syrup does the trick. SINUS WASH: A solution of salt water (I/4 teaspoon to a cup of water) sniffed from the palm of the hand unclogged a stuffy nose. 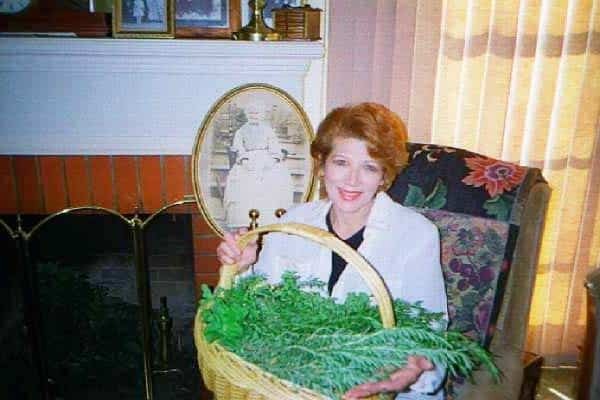 GRANDMA’S BREATH FRESHENER: Grandma loved to use parsley in her cooking and as a garnish on her dishes. But as a breath freshener it was her favorite: Bring two cups of water to a boil, add three sprigs of parsley , 1/2 teaspoon ground cloves and a sprinkle of cinnamon. Strain and use as a mouth wash.
basil& chamomile tea: Grandma brewed a soothing beneficial tea from her basil leaves and Chamomile blossoms Like Hypocrites, she believed sage and chamomile were among the universal remedies. To relax a nervous stomach, Grandma added two teaspoon of dried basil leaves and two teaspoons of dried chamomile into a teapot of boiling water. hint: place the herbal mixture in a coffee filter and secure top with rubber band and allow the bundle to steep in the teapot for 4 to 5 minutes, or place the little bundle of herbs in the teapots infuser and let steep.) to extract all the flavor and goodness takes a good 5 minutes or more. It worked like magic on my childhood bellyaches. GRANDMA’S Cure For The Common Cold: Grandma’s chicken soup enticed our appetites and cured our colds for generations. Was there a magic healing power in her recipe? Who knows? One thing I do know there are no cold remedies on the market today that compare to a loving touch and a pot of homemade soup seasoned with love in every bowl. GRANDMA’S OLD-FASHIONED ROOM DEODORIZERS: Grandma never used an aerosol spray can , she hated them. And yet, her home smelled as fresh and as if it had been sprayed with a fragrant room deodorizer. To rid her kitchen of an unpleasant odor Grandma placed a small pot of water on the stove to boil; she tossed in a few sprigs of rosemary,some cloves and lemon rinds. The spicy steam filled ever room of her house with the welcoming aroma of warm spices and citrus. Bouquets of orange blossoms, lemon leaves , roses, and fragrant lavender bought grandma’s garden into the house. OLD FASHION FURNITURE POLISH: Grandma never bought furniture polish. Instead she used a variety of oils, lemon, vegetable, or olive oil, mixed with water and a small capful of liquid soap. Shaken and rubbed into the wood, it gives luster to all wooden furniture. FRESH CUT FLOWERS : To keep fresh-cut flowers lasting longer in a vase , Grandma added a capful of bleach and a teaspoon of sugar to a gallon of warm water. Water should be warm, to avoid shocking the blossoms , if flowers were picked in the hot in afternoon sun) The bleach stopped the growth of bacteria and sugar feeds nutrients to the plant. It’s best to pick flowers early in the morning and cut on an angle using a sharp cutter. BUG KILLER: Grandma was opposed to using insecticides She kept bugs out of her kitchen by using crushed mint leaves or sprinkling borax or pepper flacks under her kitchen sink and near entrances. Another old trick was olive oil poured where the ants entered the house . Another old trick was lemon juice, Ants hate lemon juice and grandma would pick a fresh lemon and squeeze it where they came in the house. To remove sails from her garden she filled a bucket with bear . in the morning it was filled with dead creepy crawlers. Many years ago, I paid my Italian grandmother a last visit. On that day, she insisted I take home some seedlings from her bountiful garden: a piece of this, a smidgen of that and a handful of her finest sunflower seeds. She searched carefully through her garden for the perfect seedlings, uprooting several oregano, chamomile and rosemary plants, including the bitter rucola. Every plant, that is, except her bountiful parsley. It was Nonna’s belief that to transplant parsley would bring bad luck. She believed that an unmarried woman who transplants parsley is destined to become an early widow. I’d learned early on not to doubt Nonna’s logic. If she believed it was so, then that was good enough for me. I didn’t wish to tempt the fates over a little green herb. I would discover, years later, that the superstition against transplanting parsley plants is rooted in Greek mythology. The herb was dedicated to Persephone, goddess of the underworld. She is the daughter of Zeus and Demeter, goddess of the harvest. Parsley was used at funeral rites by the ancient Greeks. It was afterward consecrated to St. Peter in his character of successor to Charon. The Greeks held parsley in high esteem, crowning the victors at the Isthmian games with chaplets of parsley, and making wreaths for adorning tombs. It was reputed to have sprung from the blood of Archemorus, the forerunner of death, and Homer relates that chariot horses were fed with it. Greek gardens were often bordered with parsley and rue. Propagation: For centuries, my ancestors have used parsley for garnishing and to obtain chlorophyll and vitamins. Though the plant is a biennial, Grandma, like her family before her, planted parsley every fall because the first year’s leaves are the most flavorful. When going to seed, it produces white flowers that attract a variety of beneficial insects to the garden. Grandma grew only Italian parsley (Petroselinum crispum neapolitanum). The foliage of curly parsley is more attractive as a garnish, but flat-leaved Italian parsley has the most flavor when cooked. The curly leaf grows about 10 inches tall, the Italian about 18 inches. In the second year, 2-foot-tall flower stalks appear, and their blossoms ripen into seeds. Seeds collected from second-year plants and dried thoroughly will keep for two or three years. Parsley prefers full sun but will tolerate light shade. Plant in a rich soil amended with compost. (Grandma made compost from kitchen scraps and yard debris.) Soil should be well-drained. Parsley seeds may be planted in the very early spring or in the late fall in the warmer climates. Because we have such warm summers, and our weather is much like that of Italy, Grandma planted her parsley in the fall. Seeds must be planted at least 1/4 inch deep. Keep the soil damp until the seeds have germinated (six to eight weeks). Seedlings may be thinned to 3 inches apart when they are 2 to 3 inches high. Harvesting: Parsley leaves can be harvested when the plant is 6 inches tall. Leaves can be used fresh or refrigerated, frozen or dried. Grandma dried her parsley in the oven on low heat overnight, similar to dehydrating. The dark green foliage also looks nice planted among flowers. For a touch of nighttime drama, hide small white Christmas lights among the foliage to create a wonderland effect. Grandma sometimes grew her Italian parsley in pots that produced large, lovely plants. Outdoor plants can be potted in late summer and brought indoors to grow on a cool, sunny windowsill, where they will produce fresh leaves for harvesting all winter. Dig deeply when potting your plants to get as much of the long taproot as possible. Like other annuals and biennials, parsley needs a prime environment. A rich potting soil produces better plants. Today, Nonna’s chamomile, oregano and rucola grow thickly along my garden fence. Her parsley (grown from seed) borders the steps along my walkway. Although I’ve never had occasion to use Nonna’s parsley plants and other herbs to treat a bellyache, I feel better just knowing they’re out there. My Italian immigrant grandparents came to the Almaden Valley during the great migration. They were prune ranchers, cherry growers, farmers and cannery workers. The cuisine they prepared and enjoyed was essentially food grown on their land.. Much of what they harvested they ate or preserved. Their favorite food, and the one they held in highest regard, was the valley’s wild mustard green plant that grew freely in orchards and along the hillsides. Mustard’ greens correct name is Brissica rapa, a member of the Cruciferae family which includes cabbages, broccoli, and turnips. It also includes the mustard varieties that are grown for their tasty leaves, not their seeds. Three varieties of mustard greens produce seeds, which in turn are used in various aspects of cooking. Black mustard seed (Brassica nigra) is the most pungent of the three. Brassica alba, a native to the Mediterranean region, produces large yellow seeds and Brown mustard (Brassica juncea) is the one used to make Dijon-style mustards. Although native to many regions of the world,it is said that Franciscan Father Serra brought the wild mustard greens to California , planting them as a golden pathway home after his explorations here. Mustard greens are a fresh source of vitamin A, fat and cholesterol free., low in sodium and calories and high in vitamin C. The peppery leaves of the mustard plant are a rich dark green and have a pungent flavor. They belong to the same family of vegetables as collard greens, broccoli, Brussels sprouts, kale.”Hunting” for a wild mustard green patch in the valley takes plenty of skill and know how. The greens have to be picked at just the right stage of development. Once the blossoms appear the greens are no longer eatable. During the 1940s and 50s, I remember how local families would gather together early in the morning, after a springtime rain, clad in knee-high galoshes and bundled in warm clothing, we spent hours picking our favorite greens. Looking for crisp young leaves with a rich green color. Rejecting those with yellow or pitted leaves or thick, fibrous stems. Back then, valley ranchers generously allowed residents on to their orchards to pick the greens. After an exhausting morning of gathering the mustard greens our contented crew of pickers returned home – our baskets and bags filled to the brim with wet greens and our shoes and boots covered in a thick layer of orchard mud. Once we got home, we turned our kitchens into a process factory. Huge kettles of water were set on the stove to boil; the mustard greens were washed in the sink to make sure all traces of the orchard mud was removed. Then the greens were cleaned and cut and placed into a pot of boiling water. The cooked greens were drained and then sauteed in olive oil, garlic and dried red pepper. The aroma was heavenly, at least to Italian-Americans, like myself, who love mustard greens prepared Italian style. The remaining greens were boiled and frozen in bags for another dinner or kept in sealed bags for a week. “Good health for a 100 years,” the family would echo back. Then, and only then, could the meal begin. Recently, two longtime friends braved the cold weather and muddy orchards to search out a small patch of mustard greens growing in an open field off the busy 101 highway. My friends generously shared their greens with me..
How comforting to know that good friends, traditional foods, and the flavors of our heritage can still be found – perhaps not in the same abundance as we once knew them, but still here for us to enjoy. To grow mustard greens at home in your yard, be sure it is in a spot in full sun in rich well-drained soil. Mustard greens are annuals so plant the seeds in early spring, or in mild winter climates. Depending on the variety, the plants range from 2 to 4 feet tall, made up of long delicate light green stems and narrow leaves, with a tuft of yellow flowers on top. Pick before the flowers appear. The wild mustard green is not grown for its seeds but rather for its flavorful leaves. Mustard greens are not for container growing. As we raised our glasses high, grandpa’s words sang out over the dining table, “Salute’ per chinto anno,” his deep, rich voice as hardy and pure as the red wine he held in his glass. I remember how my grandfather’s face beamed with pride at these joyous occasions and how our meal never began until each family member had repeated the traditional dinner toast and sipped from our small glasses of red wine. confirmations, birthdays, graduations and marriages-another bottle of my grandpa’s homemade red wine was uncorked. Bottles were also poured on Sundays, holy days of obligation and all national holidays-there was always cause for celebration in my grandfather’s house. Grandpa believed that wine, in moderation, was a good thing. His opinion was later confirmed by a scientific study published in the U.S. Journal of Biological Chemistry on Aug. 21, 1998. In the report, a team of researchers from Cornell University suggested that trans-resveratrol, a natural substance found in high concentration in red wine, could reduce the pain of arthritis by thwarting the activation of the gene cyclozygenase-2 (cox-2), which is suspected of creating the inflammation that causes arthritis pain. But this is only one of the benefits of red wine. It was a Sunday night in November 1991 that most TV viewers and wine drinkers learned of the benefits of red wine. The event was the airing of “The French Paradox” segment on 60 Minutes, which examined the French lifestyle. While many French people eat incredible amounts of heart-stopping, artery-clogging, saturated fats, and smoke cigarettes and don’t exercise, they have a very low heart attack rate. It is their moderate and daily consumption of red wine that gives the most likely reason for this phenomenon, which was coined the French Paradox. Grandmother often put the benefits of red wine to good use as a medicinal cure. It was administered in moderation as a remedy for arthritis and to purify the blood, cure anemia, alleviate stomach cramps and prevent infection. During World War II, when cases of trench mouth and whooping-cough reached epidemic levels in the United States, Grandmother administered the rich red wine to each grandchild as a preventative mouthwash and gargle. Wine was also used as a remedy for cold sores or skin infections. Grandmother poured a little wine into a saucer and let it stand covered over night. In the morning, she dabbed the wine on the sore. The resveratrol in red wine has been found to help block DNA syntheses, a process that must occur for the herpes virus to replicate itself. However, it has been discovered that a much greater concentration of resveratrol than that found in red wine is needed to cure the stubborn virus. As a teenager, I recall the looks of astonishment on the faces of my non-Italian friends as they watched Father fill my dinner glass with wine. To those who objected, father would simply say, “Wine is served in church at the communion rail, is it not? And it was served at the Last Supper.” End of discussion. Father’s house was a peaceful one and a place where he felt happiest. He eliminated the extraneous and engaged in living a simple and satisfying lifestyle. His home was well-balanced, filled with the practical things he needed and the people he loved. He had his own quiet corner, to which he retreated after a robust meal. It was his belief that the soul sighs after eating a large, traditional dinner and that one should spend time in contemplation and reflection. Father reflected at least an hour after every meal-the sound of his contented snore vibrated though the house. Winemakers on the East Coast had to wait for good winemaking grapes like Malaga and Zinfandel to come in by rail car from California. But Santa Clara Valley winemakers, like Father, were lucky enough to have the plentiful grapes of the Napa and Almaden valleys practically in their backyards. They only had to drive in their pickups to local vineyards to buy boxes of the finest grapes. Some old-timers nurtured their own tiny grape vineyards for the express purpose of making their own red wine. Devoted winemakers, like Father, usually owned their own grape-crushers, while others rented or borrowed one each fall. After the crush was finished, the juice was poured by funnel into the huge oak barrels, which had been cured with sulfur smoke. Here’s where the talent for good winemaking would come in. One mistake and the winemaker’s barrels would be filled with vinegar instead of wine. But, like Father, most winemakers had inherited their skills from the Old Country and rarely made a bad batch. My favorite memory of winemaking was how the family gathered together at the ranch house to help father make the wine. The hub of activity was usually in Grandmother’s kitchen, where the ladies were hard at work making pastas, sausages, raviolis and hot tomato ketchup, in preparation for a grand October feast. The aroma of roasted bell peppers wafted through the air from Grandmother’s hot oven, filling our nostrils with their wonderful pungent smell. In the fall, the men in the family gathered in the cellar to cure the wine barrels and to help father set up his winepress. Some of the men helped father haul in the grapes; others set up the grape-crusher and some others cured the oak barrels. As a child, I remember hearing Papa and Nonna speak of the renowned vineyards of Brolio Castle, the baronial estate of the Ricasoli family, an area famed for its Chianti wine. It is said that wine has been made in this region of Italy since 1000 C.E. It was this revered standard of Chianti that father tried his best to clone. “Drink no longer water, but use a little wine for thy stomach’s sake,” advised Paul in the Bible. Wine has been around for thousands of years. Its benefits have been passed down from generation to generation. But only recently, thanks to modern medicine, we now have scientific proof that wine can aid digestion and wipe out bacteria better than bismuth salicylate (Pepto Bismol). Both grandma and grandpa loved red wine. They had it with dinner and they included it in may recipes. Research has found that Red wine may suppress one of the main chemical culprits in heart disease. “Dark as the devil, hot as hell, pure as an angel, sweet as love.” Such was the respected opinion of Charles Maurice de Talleyrands when asked to describe a perfect cup of coffee. For awhile, it appeared the tea bag was going to replace Coffee as America’s favorite hot brew, or at least give it a run for its money. Tea houses were springing up all over town; tea pots and tea paraphernalia were popular items at the local gift shop and tea boutiques. But things began to change when “Starbucks” came along. The coffee shop began to replace the tea house in popularity. The irresistible aroma and delectable flavors of brewed coffee soon attracted its loyal flock back to the fold. Do coffee lovers prefer a cup or a mug? Along with a lot of questions coffee manufactures are researching, this topic is among them. So far, cups are in the lead by 12 percent, but mugs are making a strong bid for first place. Research has also shown that coffee is consumed by more Americans than any other beverage , and on a winter’s day it is estimated that for every person 12 years and older two cups of coffee are consumed. Like most people, my first cup of coffee in the morning is my most anticipated. Whether it be made from Arabica beans (superior quality, grown at higher altitudes) or Robusta beans (less expensive, grown at lower levels) it makes no matter at 7 a.m., just as long as it’s hot and handy and I can drink my two-cup dose of caffeine. Caffeine is the alkaloid in coffee that acts both as a stimulant and a diuretic. Coffee and tea have the ability to both calm and invigorate. Perhaps that’s the basis for their enduring appeal, their psychological grip on us. When we’re feeling tired or out of sorts, we reach for a cup of coffee or tea to set us right. When we’re feeling unnerved or excitable, we pour ourselves a soothing cup of hot coffee, or tea to calm us down. This reaction to coffee and tea is an individual one, but it has long been used as a common prescription to cure the small ails of our day. In early France and England coffee was considered not only a drink but a panacea – useful for everything from sore throats to smallpox. And herbal teas are legend as a cure for everything from stomach aches to heartaches. Gulped in the morning from our favorite chipped cup, enjoyed from tall icy glasses or lingered over in a cup of fine old china, coffee and tea has intertwined American lives for centuries. As far back as 575 A.D. the Persian armies knew about the effects of coffee beans and carried them to Yemen, on the Arabian peninsula. According to the New Book of Knowledge traders later took the seeds to India, Turkey, Mocha and Java in the East Indies, where the climate was perfect for growing of coffee. How coffee was first discovered is still somewhat of a mystery. Legend has it that a goat-herder discovered the coffee bean quite by accident, while watching his flock nibble at the plant’s fruit, he noticed his goats suddenly becoming frisky and agitated. The curious goat herder sampled the plant and felt stimulated and refreshed. During the 17th century coffee was introduced to North America. Across the seas, coffee houses were springing up all over England. King Charles II became suspicious of these popular coffee-house gatherings. Convinced that plots against his government were being hatched there, he soon proclaimed that they all be closed. But coffee was so in demand that the king was forced to bow to the will of his coffee drinking people and revoked his command. In the orient, it was used for a slightly different purpose, it’s strong, bitter flavor often disguised a helping of deadly poison. Thus, the expression, “Here’s your cup of poison” may have derived from this Eastern practice. The brewing of a good cup of coffee can be a time-consuming ritual, or a tour de gadgetry for others. When I was a kid, we could always tell when a pot of grandma’s morning coffee was about to be brewed. The sound of her hand-cranked coffee grinder, churning softly at break of day, followed by the rich aroma of steaming coffee, roused us from our beds and drew us to the comfort of her warm kitchen. The old coffee grinder was a family antique and the coffee made with it was “magnifico ,” its aroma – unforgettable. And what about tea and its faithful followers. Well, according to the world almanac, after plain water, tea, is the most widely consumed beverage in the world. Ancient Chinese folklore tells us tea was discovered by the Chinese emperor Shen Nung in 2737 B.C.E , when leaves from a wild tea bush fell into a pot of his drinking water as it was being boiled. The emperor enjoyed the flavor of his newly derived brew and thus the first cup of tea was made. In 1904, an English tea merchant placed several small samples of his tea in silk bags. His customers soon found this a simple and convenient way of brewing one cup of tea at a time. Later, thanks to American know how and ingenuity, and our penchant for rushing things, the instant cup of tea was invented. The true tea fancier, however, deplores this type of tea, believing that preparation and brewing is the best part of the tea ritual. The venerable herb teas, once concocted in grandma’s kitchen as a family remedy, have been resurrected by today’s tea manufacturers. The consumers are offered a variety of herbal mixtures and blends. Many of these teas are promoted as a treatment for emotional and physical ills. Today’s tea market is enjoying a multimillion dollar industry. The tea house may be disappearing from the community, but the sale of tea is up. Die -hard tea drinkers continue to set the kettle on to boil. Today, local coffeehouses, such as, Starbucks,” “Coffee Roasting Co.” and “Peets,” are popular gathering spots for friends and family. The air along the business district is fragrant and warmed by the wafting aroma of freshly brewed Arabian Mocha Java. The coffee faithful gather here in cozy corners or sunlit curbside tables, to talk, laugh, socialize, conduct business and sip the blend of the day. Coffee devotees never let the sun set on a day without finding solace in a cup of their favorite brew. In a cup of very hot coffee, devolve a small square of dark chocolate ( any solid chocolate bar will do) add half & half cream to taste add a jigger of armaretto liquor and top with whipping cream and sprinkles. Very, very good! Calcium, for strong bones and for maintaining blood pH, is found in broccoli, lettuce, green beans, cauliflower, Brussels sprouts, celery, and parsley. Copper, for elasticity of blood vessels and heart, is found in vegetables grown in soil rich in minerals, contained in humus. Iron, to build up blood and carry oxygen to cells, is found in spinach, collards, tomatoes, peppers, cucumbers, and parsley. Manganese, needed to metabolize proteins and fats, is found in such legumes as beans, peas, and lentils. Selenium, an antioxidant believed to protect cells, is found in corn and legumes. Soil enriched in pulverized kelp will contain this chemical. Vitamin A, an antioxidant and immune system booster, is found in carrots, bell peppers, butternut squash, collards, parsley, and spinach. Vitamin B6, taken to metabolize protein and control symptoms of stress, is found in spinach, cauliflower, broccoli, eggplant, beans, tomatoes, squash, parsley, and lettuce. Vitamin C, an essential nutrient thought to prevent colds, is found in sweet peppers, tomatoes, watermelon, Brussels sprouts, collards, spinach, cabbage, broccoli, beans, and celery. Vitamin E, an antioxidant and, some say, a sexual potency enhancer, is found in legumes and leafy green vegetables, such as collards. Zinc, for cell division, growth, sunburn, bug bites and healing, is found in spinach, parsley, lettuce, squash, and beans, such as limas.